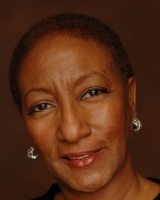 Cheryl D. Edwards was born in Miami Beach, Florida. She began her studies in art during 1988 in New York City in a class at the Art Student League taught by the late, Ernest Crichlow. She has been living in Washington, DC for the past 23 years. Cheryl has exhibited in many shows in the Washington, DC, New York, Virginia, Maryland, Miami, Texas, Germany and Hong Kong. Her interest in art stems from her fascination of the human body as a whole. Her medium is oil, ink and acrylics. Please contact her for viewings and/or visit her website: Cheryl-edwards.artistwebsites.com. Currently represented by Susanne Junggeburth Gallery (Germany). Homegrown, Group exhibit, DC Arts Commission Art Gallery, D.C.
Brentwood Center for the Arts, group exhibit, Washington, D.C. The return is about the enslavement of Senegalese people and how they preserved to survive that period of darkness in their history. The work of Cheryl Edwards begins from the beginning of the most abhorred period in Senegal with the â€œDoor of No Returnâ€; which is geographically located in Goree Island, Senegal. The action of perseverance is depicted in semi abstract spiritual pieces of work embodied with strong symbolism, which appeals to everyone on a universal plane. The series ends with every day scenes of what Senegal looks like in todayâ€™s society. This series sets forth the concept of the use of dolls by the Ndebele People of South Africa. Traditionally all over the world dolls are inevitably used for play and also used for performing rituals. The series consist of 19 artworks using a technique, which combines ink and water-soluble oils. The works depict a combination of the Ndebele people in South Africa in common everyday scenes, and the work demonstrates through creative visual the effect of the use of dolls for the purpose of performing rituals. Dolls have been historically used by the Ndebele People to enhance the possibility of marriage and childbirth. A more widespread usage is to employ a doll to assist in a healing ritual. Many of the dolls made by the Ndebele woman are representative of the traditional healers (Sangoma); they are notably recognized by their dress and always accompanied by a red blanket or cloth worn over their shoulders. This is symbolic of protection of oneâ€™s powers. This series opened for exhibit at the Wohlfarth Galleries in Washington, DC on October 17, 2008. This series depicts the simplicity and beauty of the water towers seen on the roof tops in New York City. The paintings are semi-abstract and captures the shapes and lines of the city incorporated with the balancing shapes of the water towers. The series consist of 20 paintings using the medium of ink and water soluble oils. This exhibit opened in December 2009 at the Sitar Center for the Arts, Cafritz Gallery located in Adams Morgan community in the District of Columbia. Modern Day Madonna is an interpretation of the modern mother and son image. The eyes of each painting depict the love and the emotions of the maternal family. The series originally consist of eight painting using the medium of ink, water soluble oils and epoxy resin. One of the Madonnaâ€™s was juried into an exhibit and shown at the Washington County Museum of Fine Art. Occupy America is a series which consist of 30 completed works. It is composed of mixed media to include lino and wood cut prints, photo transfer, collage and acylics. There are reoccuring images within many of the works. It is intended to let the viewer feel through the visual the state of American people during these times. 12 works on board. Ink and gesso are the primary mediums of the portraits documenting the ancestry of Afro- Asian families. 28 completed abstract works in mixed media on bard and paper. This is a ongoing series of work exploring the relationship of form, color and shapes. It is a derivative of older series of work about the Ndebele Dolls. Advisor to the Washington Sculptor Group, D.C.
Board member to the Studio Visit, D.C.